The Emerald Ash Borer, or EAB, is a serious problem for many Midwestern states, as well as Canada. It's already been found in Green Bay and St. Paul. 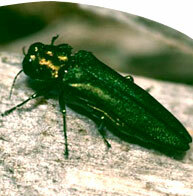 This small, dark metallic green beetle attacks all species of ash trees, and it can be devastating. Native ash trees have no resistance to EAB, and natural enemies have had little effect once EAB populations are high. Master Plan Landscapes understands the threat of this pest and is certified in preventing and fighting the infestation. We also follow all regulations concerning the transportation of ash trees and ash logs from nurseries. Prevention--EAB is spreading faster than predicted, but the proper chemical treatment can protect trees for two years or more. The minimum tree size that can be protected is one with a 4" trunk. EAB only reproduces on ash trees, so no other trees need protection. Treatment--When found on a tree, EAB has usually been there for two years already. Once EAB is present, the ash tree will die if not treated. A treatment can be applied that can save an ash tree even with 50% canopy thinning (see symptoms of EAB below). As a homeowner, you can help by carefully monitoring your ash trees for signs and symptoms of EAB throughout the year. The canopy of infested ash trees begins to thin above infested portions of the trunk and major branches. This happens because the insect destroys the water and nutrient conducting tissues under the bark. Most of the canopy will be dead within two years of when symptoms are first observed. You can also help by calling Master Plan Landscapes, even before you notice symptoms. By treating your ash trees now, you'll be preventing the spread of EAB and saving your precious trees.